Professional Quality light tablets - Never gets hot to the touch! 30,000+ hours of LED illumination! The Acurit Light Tablet is the perfect tool for artists seeking to hone their drawing skills! Whether they are tracing a photograph or works of art created by the old masters, artists will not miss a single detail with the vivid, LED illumination that is offered by these light tablets. Temperature is color corrected and has a tempered glass top which you need if you are going to cut stencils. Over 30,000 hours of brilliant, crisp, LED illumination! Includes a UL approved AC power adapter – no batteries needed! Artists of all ages and skill levels! 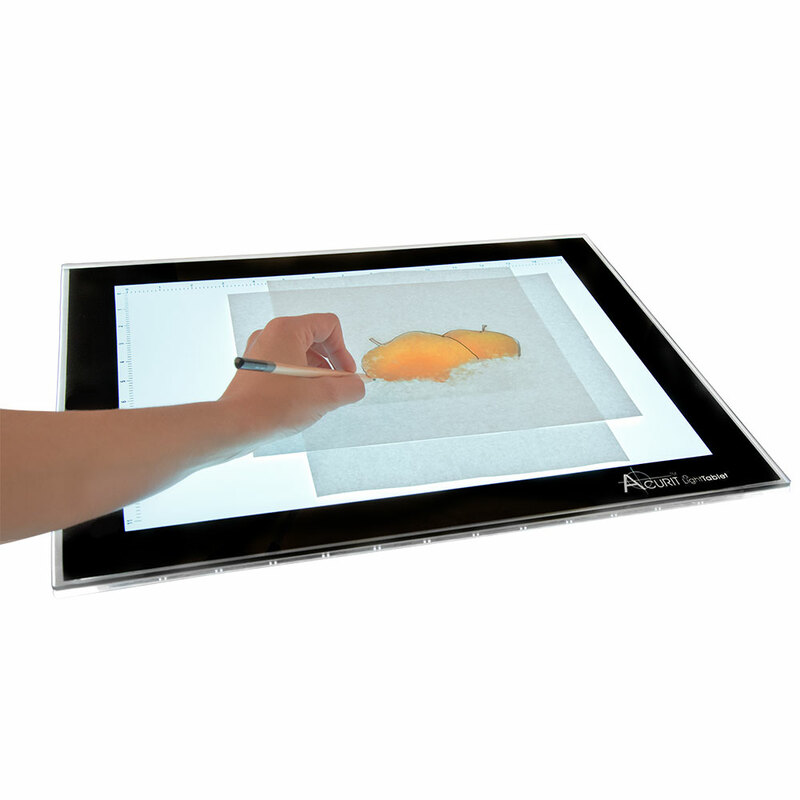 The Acurit Light Tablet is the perfect tool for artists seeking to hone their drawing skills! Whether they are tracing a photograph or works of art created by the old masters, artists will not miss a single detail with the vivid, LED illumination that is offered by these light tablets. Their color temperature ranges from 6,000 to 6,400K and they feature an adjustable dimmer, for varied lighting environments. Acurit light tablets are available in 3 highly portable sizes and only require a power outlet to work – no batteries needed! Their durable and scratch-resistant, 3mm thick, tempered glass surface makes them the ideal light tablet for artists on the go, students and artists of all ages! Use these light tablets for hours, as they never get hot to the touch and their LED lighting system guarantees over 30,000 hours of brilliant lighting, across the entire surface area. Acurit light tablets also include a 1” scale border, for easy measuring. For a more comfortable working angle, the Small and Medium light tablets feature legs, which can be easily flipped open, while the Large model features soft anti-slip bottom pads. Each Acurit light tablet comes complete with a UL approved AC power adapter. Features a tempered glass top for cutting stencils. Excellent with any Creative Mark canvas pad or Fabriano 140 lb. paper - It's that good! 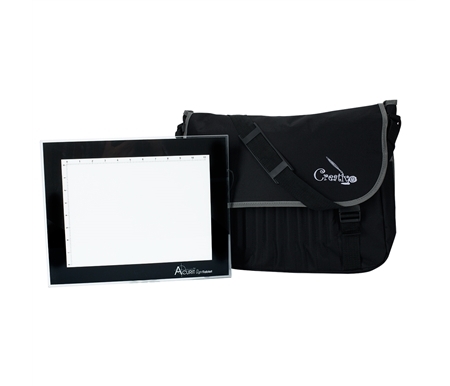 Buy Acurit Light Tablet Combo kits with Creativo Messenger Bag included and Save Up to $63.79! Acurit LED Light Tablets is rated 4.9 out of 5 by 41. Rated 5 out of 5 by Joshua S from Fantastic Light Table Got this light table for a great price and with tax return time I figured why not. Not only does it not get hot, but it has been a great workhorse for the day to day tasks. It's a little on the heavy side so probably isnt good for travel, but its not bulky in any way, might just be the glass that's used.. A great at home light table. Rated 4 out of 5 by sargesuey from Great features I bought this Acurit LED light tablet this month and love it! Rated 5 out of 5 by Mary 625 from Exactly as described. I needed proper placement for some artwork I was making. This product was exactly as it claimed. The adjustable light brightening feature came in handy. Rated 5 out of 5 by Wileyhillbob from Everything I expected. Just opened the box. Plugs together in a flash. Love the dimmable backlight, and the glass work surface. Rated 5 out of 5 by Lgrove from Light tablet I love this light tablet the size is amazing and it is so bright. Rated 5 out of 5 by Susan504 from Wonderful tool, so happy with my purchase I use the light tablet for calligraphy and it is a great help. The surface of the tablet does not get hot and the light can be adjusted. Great quality product. I have the ACURIT LIGHT TABLET A3. The power adapter cord broke off the adapter. &nbsp;Where can I buy POWER ADAPTER AC 100-240V? Thank you for contacting us. We do not sell the power cord separately. I was able to find many sellers of this item when I searched for the term &quot;Power adapter AC 100-240V&quot; on google. Please let us know if you have any other questions or concerns. The LED light has a 6,000-6,400K color temperature. he three primary types of color temperature for light bulbs are Soft White (2700K &ndash; 3000K), Bright White/Cool White (3500K &ndash; 4100K), and Daylight (5000K &ndash; 6500K). The higher the Degrees Kelvin, the whiter the color temperature. Please let us know if you have any other questions or concerns. Is this product under warrenty? Thank you for contacting us. This LED light tablet is a proprietary item and is a Jerry's Artarama best value exclusive brand. The exclusive brands come with a 30-day money back guarantee! Please let us know if you have any other questions or concerns. Where is the Acurit light pad manufactured? Thank you for contacting us. The Acurit LED Light Tablets are a proprietary Jerry's Artarama product that is manufactured in China. Please let us know if you have any other questions or concerns. I just purchased a Studio Designs Futura Craft Station model 10097 with the light pad metal support straps. Is the Acurit medium size light pad thicker than 1/4&quot; ? Will it be able to fit between the straps and the glass top? The Acurit LED light tablets are 5/16&quot; thick which is slightly thicker than 1/4&quot; Please let us know if you have any other questions. can you trace onto canvas, as well as paper? Yes, the light can be seen through a canvas. You can trace if your design on the light tablet is bold and outlined. Please let us know if you have any other questions or concerns. Can you replace the LED once it no longer gives light? Or is the light source not replaceable, meaning you&rsquo;ll have to buy another light tablet? Thank you for contacting us. The LED light source is not replaceable, you would need to buy a new light tablet if the light stopped working after 10 years. Please let us know if you have any other questions or concerns. The major difference is that the Acurit LED Light Tablets are thinner in thickness compared to the Acurit Thin Lightboxes as you mentioned. Both lights use LED and have dimming switch. The light box has an aluminum frame and Optical quality acrylic surface, while the Acurit LED Light Tablets are made of tempered glass and do not have a frame. I hope that this information is helpful. Please let us know if you have any other questions or concerns. Overall size: 11.625" × 15"
Lighted area: 8.625" × 11.875"
Overall size: 15" × 18.75"
Lighted area: 11.8125" × 15.5"
Overall size: 15.75" × 23.625"
Lighted area: 12.625" × 20.5"
Acurit Large Light Tablet paired with the state of the art SOHO Drawing Board! Overall Size 15.75" x 23.625" - Lighted Size 12.625" × 20.5"